I’ve been thinking about switching ISPs now since there’s 5 of us using the internet at home and 5mbps won’t cut it anymore. Sky Broadband intrigued me a lot because they offered 50mbps for just P2899/month. I’m currently paying more or less P2400 for 5mbps and switching over makes a lot of sense. The thing is I’ve read a lot of negative reviews and complaints online. To allay or at least lessen my worries, I talked to someone from their Engineering department and asked questions about their infrastructure and service in my area. After our talk, it looks like the area I live in (San Pedro, Laguna) does not have much problems like in other areas. 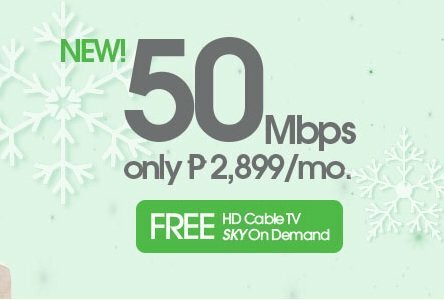 So to cut the story short, I bit the bullet, switched to Sky Cable Broadband and availed of their 50mbps plan and so far so good! However, it’s not as stable as my former ISP (Globelines). It’s just been a few days but I noticed that it goes down randomly at certain times of the day. Thus, I decided I will do speed tests regularly so that others looking for Sky Broadband reviews will benefit as well. I see ads on FB about Sky’s new Internet plans. However, due to my bad connection recently and the relative popularity of this post, I feel obliged to give a quick update on this. And now it’s back up again but still quite slow. So for anyone asking if this is good for gaming, my answer is NO, it’s not good for gaming. If you are a light internet surfer then yeah probably this is okay for you. But if you are into games, then this won’t be good for you. If you still want to get any of their plans though, I suggest you get a backup ISP. You can use your phone’s data plan as back-up or get a new wired one like I did before (I got Globe). That way, you’d have no problems if one of them goes down. Spoke too soon. It’s bad again. I’m very decided now. Will shift to a different ISP. Funny update. I posted this blog post link on the SkyBroadband FB page yesterday and today, the connection is much much better. So I guess a bit of media exposure is what’s needed to get better service (after a month of bad service). Let’s see how this holds up. The internet today is very very very unstable. It’s fast then it’s slow then it’s gone, repeatedly, throughout the whole day, and I’m fed up with having to go through this almost every single day. I’ve decided to terminate the account even if I have to pay the 3000 pesos fee. 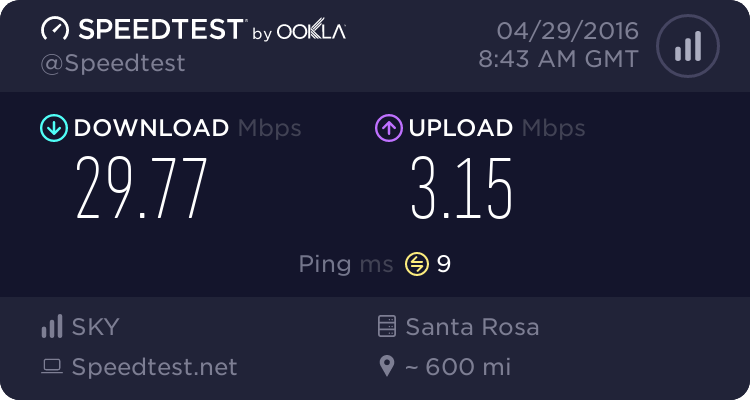 According to the speed test below for today, the internet looks and is supposed to be fast – but it is not. Pages do load but media (images and videos) within those pages loads slowly. 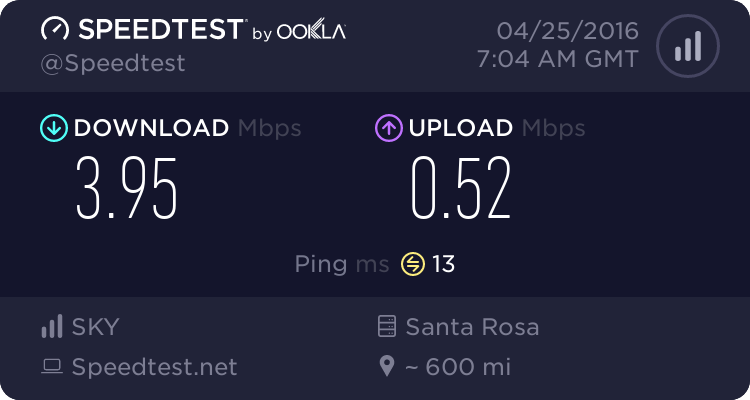 Today is bad internet day – again. Yes, below you see that I have decent internet speeds BUT it’s not like that all the time. I get good speeds one minute and then no internet connection next. This happens in spurts of say 20 minutes and this is getting very irritating. 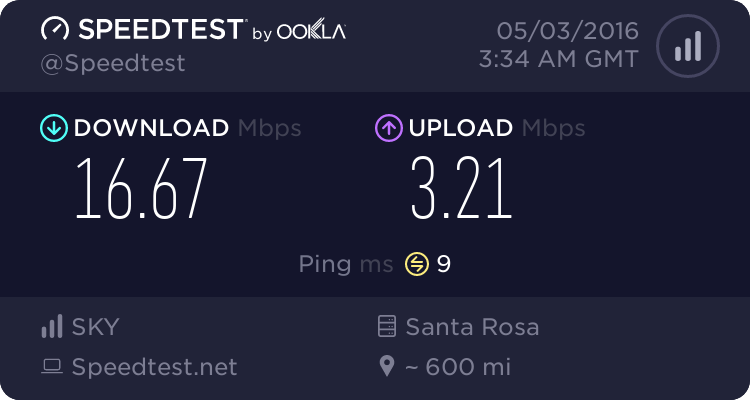 Like I mentioned, I have a backup internet connection (SmartBro prepaid) and I’m updating this blog using that connection. I created an account last month over at http://www.mysky.com.ph/ so that I will be able to get my billing statement online. When I signed-up, I didn’t get any statement and I thought that was because I was new and therefore no statement has been issued yet. But it has been a month now and I’ve received my paper billing statement but the online equivalent is still non-existent!! I’ve texted them today about this issue since I cannot get a hold of them on the phone (which is another rant because I called them on their hotline (02) 381 0000, got through the automated stuff but in the end when I was supposed to speak to an agent, no one answered the phone!!!). Anyway, to be fair, as seen in the speed test below, the internet is quite good at this time of the day. Let’s see if it holds up. This is the worst day. The internet was fine during lunch, but it went down the drain in the afternoon. Intermittent internet up until now (11:03PM). And this is not an isolated case either. I’ve been having this problem the past few days and it’s only now that I’m able to blog about it. Type 1 seldom happens. And when it does, most of the time you get it at midnight or later. Type 2 is most frequent type of speed I get (10 to less than 20 range). Although the past few days, it’s been alternating between Type 2 and Type 3. Today, it’s mostly Type 4. I’m very disappointed with the service so far because it always slows down when I need it the most (which is during work)! It’s like having a sports car which breaks down frequently. 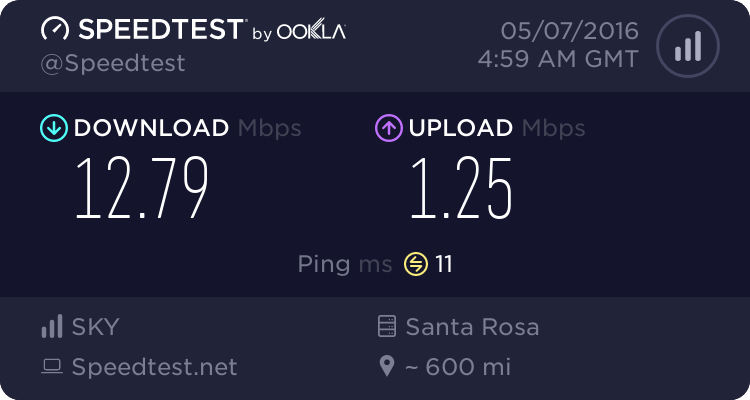 If you’re looking for a reliable internet connection, do not get SkyCable at all. I actually miss my Globe connection. Though it was only 5mbps, it was very reliable. 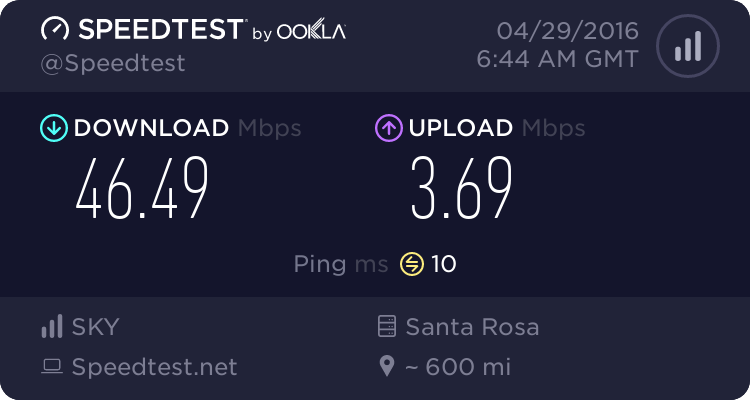 But if you can do with not reliable, you can do what I do – have a secondary internet connection. I use my tablet’s ability to tether internet as my backup internet. As always, I recommend getting a Smart Bro sim. Why? The reason is Smart has the widest coverage of the 3 major telcos – Smart, Globe, Sun. I traveled Luzon from Apari to Matnog and so far Smart has the most coverage. But I digress. 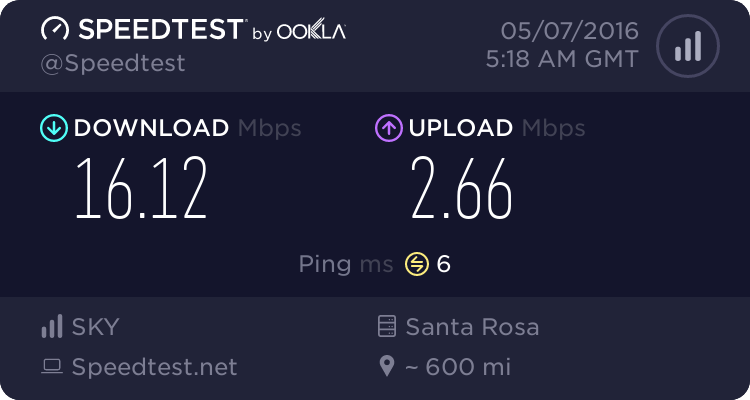 If you use your internet for work and don’t have a backup connection, again don’t get SkyCable! Another thing, the upload speed is intermittent as well and slow most of the time. If you do lots of uploading, then again find another internet provider! Another reason why is with a fast internet and good data plan now you can access your personal online work space remotely on your preferred device with safe and secure virtual PCs from CloudDesktopOnline powered by one of the best DaaS providers – www.Apps4Rent.com. 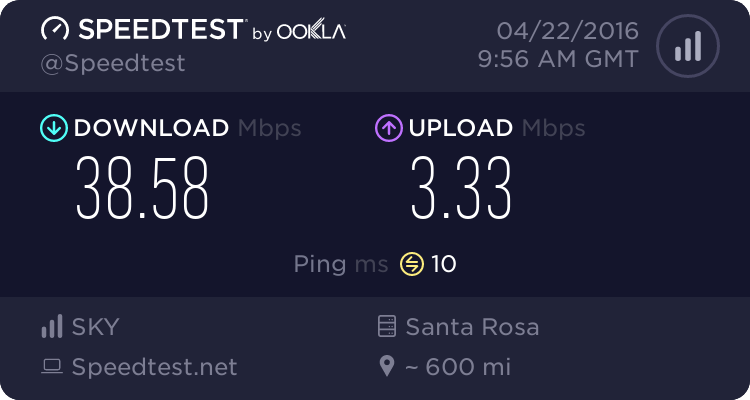 I’m going to be slightly changing how I do speed tests. Starting today, I’ll do sets of 3 each time I have a testing session. This way, I can see how stable(or unstable) the connection is. Looks like I’m having slow internet before midnight. 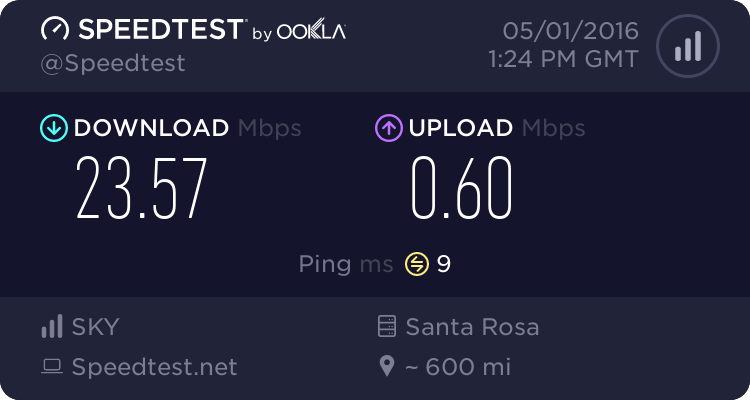 Not even reaching 1mbps! I hope this gets fixed by the time I wake up. It’s been almost a month since I first signed up and here’s what I have to say about Sky Cable. When it’s fast, it’s blazing fast but when it’s slow it’s very slow. 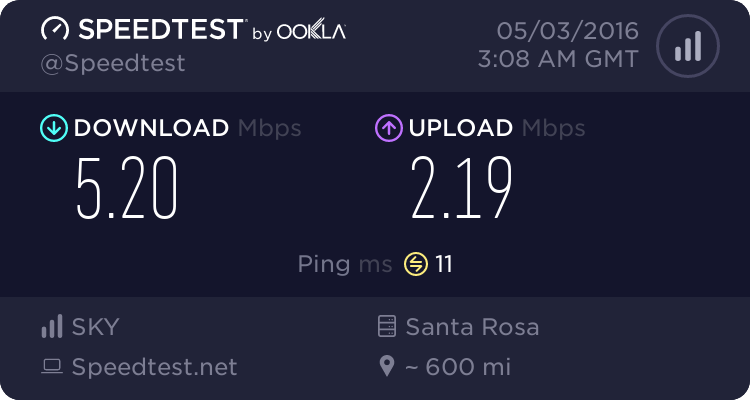 I guess what I’m saying is my connection is not as stable as I want it to be. I must say the internet has been pretty stable the past couple of days. I was expecting it to slow down a bit during the holidays but no it’s quite good actually. I hope it stays that way. It looks like internet is good the past couple of days. 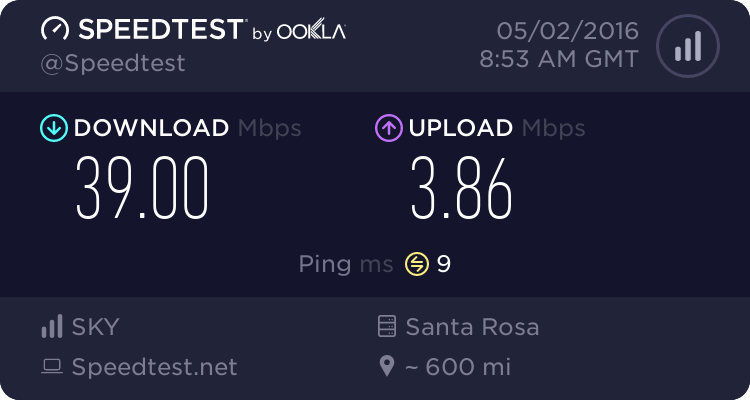 The only thing is the Upload speed fluctuates and is poor most of the time. This is bad for me as I usually upload things as part of my work. Anyway, at least it’s not zero. If you’re wondering why I always use Skybroadband as the server, I just want to be fair to them and want to be consistent at the same time. The only time I don’t use their server for testing is when it’s not available. Just to make sure that the speed result is correct, I manually do a download from somewhere else and the download rate I get is commensurate with the one I get from the speed result. Looks like the connection’s getting better now since yesterday PM. Hope it stays that way. 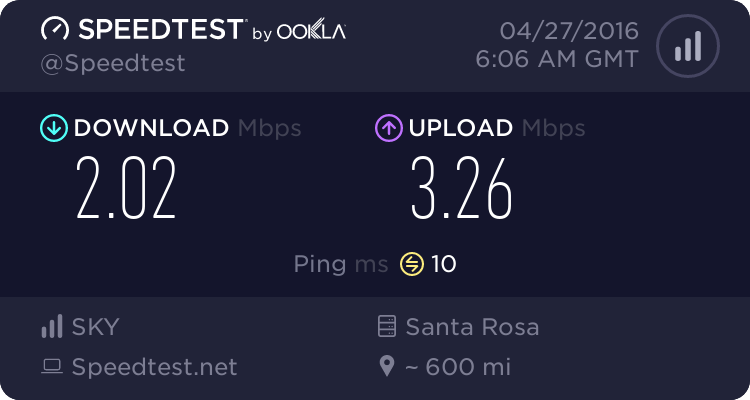 It’s been a few days straight since March 14 that I’ve had bad internet. So it was only 1 week of good internet. Is Sky Broadband showing it’s true colors now? We’ll see. Looks like March 14 is a bad day. Let’s see what happens tomorrow. What area area you in?